A live Masterclass full of practical exercises to uncover your Unique Design Style and unlock the Simple Secrets to a Beautiful Home. Be empowered to make design style choices with confidence so that you can complete your projects with ease, within budget and timescale. Leave with a workbook and mood board detailing your journey of discovery to always refer back to. There are only 20 places available on this Masterclass. Your investment is only £299.00 which includes all materials, workbooks, refreshments and a 2 course lunch in the restaurant. Stop wasting time and money - invest wisely and with confidence in your home. Who is the day suitable for? Men and women aged over 18, working on a personal redecoration, refurb, extension or new build project. If your desire is to complete your project with ease, within budget and timescale, then you need to be empowered to make decisions with confidence. This Cornerstone Masterclass is where you need to start - you can complete your project with ease, within your budgets and timescale if you know your unique design style. The venue is fully accessible for wheelchair users – please let me know if you have any particular needs that I should be aware of to ensure your day is perfect for you. What skills do I need to attend this Interior Design Masterclass? More important than anything else is your enthusiasm and desire to learn and implement straight away. There are no specific skills needed. There will be a questionnaire sent to you prior to the masterclass which will ask about your experience to date with your own projects. The day will be split into sessions of learning and implementation. Each session will build on the one before so that at the end of the day you will leave having confidence in your unique design style. It is important that you do not arrive late as you will miss a very important part of the day if you do. All refreshments will be provided and there is a 2 course lunch in the hotel restaurant which will cater for all dietary needs. Why should I invest in this particular Cornerstone Masterclass? This Masterclass is purposely limited to a maximum of 20 delegates. This means there will be enough time for me to spend individual time with each delegate. This Masterclass is one of 4 Cornerstone Masterclasses. This masterclass is fundamental to your design projects success. If you do one class only make sure its this one. Discovering your Younique Design Style will give you confidence to make design based decisions, and clarity to know how to make the right choices for your home. It's an ideal day for those you love design and have an interest in styling and want to know more about 'doing it for yourself' from a Professional Interior Designer. It's a perfect day for those working on a specific project - whether that's a one room decoration, an extension, a whole house refurb or a new build. Once you know more about who you are, your projects should not overwhelm you. If you want to learn from an Interior Design professional who has worked in the Interiors industry since 1992, has a formal degree qualification in Interior Design, has run her own design practice since 2007, is a speaker and a go to expert at The Ideal Home Show and Grand Designs Live, then this unique masterclass is the right one for you. Ultimately, if you want to stop wasting money, time and effort on your projects and instead have confidence and clarity about the design choices you make and have an amazingly Happy Home, then knowing your unique design style is essential. The 5 step process I teach is unique to my Cornerstone Masterclasses. 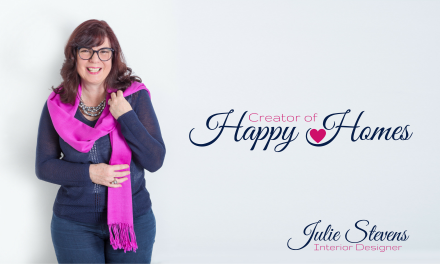 My intention is that this masterclass gives you new insights and know how, into who you are and how that benefits you when designing and managing your own Happy Home projects. What's so special about this Interior Design Masterclass compared to others? Following the Masterclass you will have the opportunity to have a private, 45 minute, call with me to follow up on your progress and to answer any additional questions that may have arisen since the masterclass. (This call will be scheduled during lunch on the day). This is a very personalised masterclass and is designed to empower you to be able to make design choices and decisions with greater confidence and clarity based upon you discovering your own unique Style. For those of you who are new to me, I am Julie Stevens. I have been working in the Design industry since 1992 and running my own Interior Design Consultancy since 2007. I have a BA Hons Degree in Interior Design and Architecture and have worked with commercial and residential clients. I love all things design and architecture and can be found regularly walking with my head up, camera in hand, looking at the sky line of a city, or in an art gallery, or just basking in nature and its divine beauty. During this time I have worked with many clients who have struggled to find their own uniqueness. They may be able to copy something they find in a magazine but the lasting effect is not beneficial on a emotional and deep happiness level. There seems to be something missing or 'not quite right'. Over the years I have developed this 5 step process to take my clients on a journey to find their own unique design style preferences. Up until now this has been shared only with my 1 2 1 clients. I am really excited to be offering this masterclass. Its one of 4 Cornerstone Masterclasses and in my opinion the one that everyone should attend before undertaking any further home design projects. Discovering your unique design style preferences is illuminating and exciting, and a very personal journey. I will be delighted to welcome you to this unique experience.